The Adobe product suite is currently an integral part of most enterprises across myriad sectors and is also the preferred choice among organizations in a transition from a legacy environment to a digital and far-more sophisticated one. Although each invention belonging to the Adobe suite, which comprises of a string of products, has found many takers, the success of the Adobe Experience Cloud in particular, is a noteworthy milestone. In a bid to embrace virtualization, many enterprises adopted this cutting-edge product from Adobe’s arsenal. However, many questions plague the minds of decision makers such as seamless integration of Adobe’s products with their existing processes, cost of implementation and aligning the utilization of the products with enterprise goals. Many enterprises across sectors worldwide are now seeking the assistance of leading solution providers to exploit the benefits of Adobe and adopt the firm’s products in an enterprise-specific manner. The recent times have also seen the rise of many Adobe partner firms too and thus, many enterprise bosses adhere to the practice of seeking the expertise of these vendors rather than procuring products independently. In the wake of the current digitization climate, where organizations are trying to procure the products engineered by firms such as Adobe in an enterprise-specific manner, our editorial board conducted a comprehensive study of promising solution providers from across the globe. 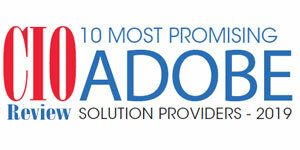 This edition of our magazine, a compilation of ‘10 Most Promising Adobe Solution Providers - 2019’ is a result of their efforts. We hope this compilation significantly helps all you readers, thought leaders, industry veterans and young entrepreneurs in pursuit of an ideal vendor.